As a Ride leader, you are a representative of the club. As such, you should be informative and friendly and be sure that new riders know the route and are not left to feel they are not “part of the group”. Your actions on club rides may be the lasting impression that new riders remember of BCC. If you think you’d like to become a ride leader, attend Ride Leader Orientation, volunteer to be an Assistant Ride Leader or contact the Road Captain to have a mentor to co-lead with you and the ride you wish to lead. This way you can quickly pick up on the ins and outs of leading a club ride. BCC rides are open to everyone who is willing and able to participate safely and cooperatively. A ride description may specify the rider experience level that the ride is primarily intended for, but with the exception of rides limited to Club Members, or restricted to our Women's only event, cannot exclude any group. This policy is not intended to limit a ride leader's right to suggest that a rider abandon any club event based upon the rider's lack of ability, equipment, or actions on that ride or a previous one. BCC members who want to lead a ride must attend a Ride Leader Training session, to be scheduled several times during the calendar year. Event dates and times will be listed on the Club ride calendar. Even if you are a current ride leader, annual re-certification is required! You must be an Active Member and have attended at least five BCC CLUB RIDES – not including pay events. You must be subscribed to the club e-mail list to post notes and cancellations if required for your ride. Be sure to use the email you provided to the club database. As a Ride Leader you will also be subscribed to the Ride Leader list – that allows you to find a substitute leader should a conflict arise with your scheduled date and time. Lead 10 rides for a Ride Leader award. Remember that must you ride 10 Social, or 7 Metrics, or 7 SuperSeries, or 10 Climbs, or 7 Mountain Bike for a “Series” award from the Club. Tell prospective members on your rides about it! providing cue sheets or marked route for Series rides. ensuring that all riders have signed in and have safely returned. Fee events don’t provide ride leader credit. Minimum of two riders is required for ride mileage credit on any approved club ride. Club mileage is awarded for ANY in-state event with open registration and approved on the BCC calendar where two members or more participate and a member submits a sign-up sheet. Out-of-state events, either fee or scheduled club rides, require attendance by a minimum of 5 BCC members. Use these guidelines plus a healthy dose of common sense for each and every BCC ride that you lead. Start with a mapping software then drive it or ride it to finalize your cue or mark the route. Stay off highly trafficked roads unless bike accommodations are in place. Be careful on multi-modal paths, extra precautions are necessary for horse, stroller and dog traffic. The club has an account with ridewithgps.com which includes an ever growing data base of maps that can be used for route selection or you can create your own. You can create a personal free account then request an invitation from the Road Captain for access to the club account features. The Club Calendar is intended to be an interactive tool to provide the most opportunities for our members to lead a Ride and earn their Ride Leader jersey and our members to ride the ride. 2 day notice is in effect for new rides. If a ride is already posted and you’d like to lead the same ride at a different pace, you can list that ride with 1 day notice. It takes a minimum of 2 participants to receive credit for your ride. A MAP LINK IS REQUIRED WITH YOUR RIDE POSTING to qualify for approval by the Road Captain. Check the calendar prior to scheduling your favorite ride to avoid duplication or conflict. Consider the big picture for all our Club riders. It’s a better use of our volunteer manpower if we can share the duties of putting a ride together with short and long legs and multiple ride leaders for one terrific and larger event. The only Fee event we don’t schedule up against is Little Red. Marked routes are best, especially when the number of turns add up. See GOOD BICYCLE ROUTE MARKING below. There are some inherent challenges in some municipalities. ALL Metric and Social “SERIES” ROUTES CONTINUE TO REQUIRE A MARKED or SIGNED COURSE and must be a different course from regularly scheduled daily or weekly club routes unless approved by the BCC Board. Marking Super Series routes is optional. If something comes up and you cannot lead your ride – Send an email to the Ride Leader email list before cancelling. You were enrolled when you attended A2Z orientation. Arrive in plenty of time to meet new riders and prepare your bike and yourself for the ride, at least 20 minutes before departure time. Begin the ride promptly at the advertised time. If the weather is marginal, go to the start anyway. If thunder, lightning, or driving rain or snow is imminent – it’s better to cancel at the start than expose our riders to hazards. If you need to cancel or change your start point or start time, do so far enough in advance, the night before or morning of is best – post a note to the email list and re-schedule the ride on the ride calendar – check the CANCELLED button on the Ride Calendar event at least 2 hours prior to scheduled start time. All ride participants, both members and non-members must sign the Sign-in Sheet (which you will remind riders is also their consent to the Liability Release) at the beginning of each ride. Riders under the age of 18 must have a parent or guardian sign the Minors release form provided in your Ride Leader binder. Introduce yourself – Use the script provided in your ride leader packet. Verify that everyone has signed in prior to starting the pre-ride briefing. Announce the route and route options, if any. Announce regroup locations where applicable – or no regrouping. Announce the distance and pace of the ride, particularly for first timers. Make sure new riders understand the route. With a map or cue sheet beforehand. call out “car back” when a car approaches. don’t call out clear when crossing intersections. observe traffic controls. Running a red light or a stop sign is a no-no. don’t pull in front of motorists at stop signs or lights. use proper traffic lanes. Use lane positioning before making a left turn. inform the ride leader or another rider if they leave the route. Survey the start parking area before departure to identify vehicles there for your ride. Keep the ride at the advertised pace. If stronger riders decide to go faster, the ride leader must keep to the advertised pace unless there are no other riders who wish to ride at that pace. For rides 40 miles or less in length – the ride leader may opt to lead from the front for the first half of the ride. The remaining portion of the route must be swept to ensure all riders return safely. Never leave a rider stranded. The ride leader should carry a basic tool kit, tubes, pump, patch kit, and be prepared to assist riders with mechanical problems if necessary. If you need help with mechanical repairs, recruit someone else on the ride to lend a hand. The club provides CO2 and replacement tubes to Ride Leaders using their own supplies on a club ride. Be cognizant of new riders during the entire ride. Distribute club promo material to new riders Membership is encouraged after a handful of club rides. Check the parking lot to make sure all vehicles have someone with them – Use the signup column for license numbers or windshield markers distributed while signing up. Post ride statistics to the website. This must been done within 48 HOURS of your ride! Be sure that anyone volunteering as Assistant Ride Leader gets credit. File the hard copy in your ride leader binder back folder for the entire season. Report the number of non-members AND THEIR NAMES on your ride so we can track total participation in all BCC rides. Individual non-members ride enough to place in the top 10 in club mileage, so we want to keep member records accurate. Back-check the route if the missing don’t show when you are ready to leave. In the event of an accident the Ride Leader should first attend to any injured persons. Unless the injuries are minor, emergency medical help and the police should be summoned. Any accident involving a Motorist should have a police presence. Our bikes can cost as much as a car. The Ride Leader must contact persons known to the rider at the number provided on the sign-up sheet or by accessing the injured’s phone for ICE or home numbers. The Ride Leader should secure the rider's bicycle and equipment that cannot be transported in the ambulance. Check with a nearby home or business. Take photos of the accident scene to document occurrences. Use the Incident Report to record the incident. Contact the Road Captain or any Board Member as soon as practicable after the accident so the Club Leaders are aware of circumstances. Failure to submit sign-up sheets. Failure to sweep rides, where applicable. Failure to provide cue sheets or marked routes where applicable for rides. Failure to appear for a scheduled ride that is not obviously cancelled due to weather conditions, where no attempt has been made to notify membership of a cancellation. Excessive cancellations of scheduled club rides. Completing an apprenticeship under a Ride Leader Mentor. Completing a specified number of club rides or club miles prior to re-instatement. Our Series rides are special and the road captain will deem whether a ride meets the spirit of this intent. Issues such as calendar saturation and a ride’s repetitiveness on the calendar are issues the road captain will consider. A marked or signed route is required for all local routes. It must be approved by Road Captain – putting “Social,” “Metric,” “Super Series” or “Climb” in the title doesn’t make it so. It must be a different route from our everyday rides. Remain Open Paced as a minimum. Ride Leader Sweep requirements remain in effect for all rides less than 40 miles in length. Offer a relaxed pace and be social – with a gathering spot en route or at Ride’s end to promote the social aspect. Open pace is encouraged to create safer riding conditions by spreading out the group and to attract a broader base of riders. No-drop provided for slower riders and listed in the calendar title as such – This could require the Ride Leader to recruit a group from within the ride attendees to ride along at the back of the pack with the slower paced riders. Re-group locations announced prior to ride start. No more than 1/3 or halfway point of the route. There’s really no excuse for poorly marked routes on bicycle events. While it may be considered a luxury for our weekly club rides, it does allow us to re-use some routes on a regular basis for the entire season. For routes reused during the entire season, plan to remark at least twice during the season. All you really have to do is imagine what people are experiencing as they approach decision points on a bike ride and then do what it takes to remove the uncertainty. In three seconds, a bicycle traveling 15 miles per hour will go 66 feet; at 25 mph- 110 feet. 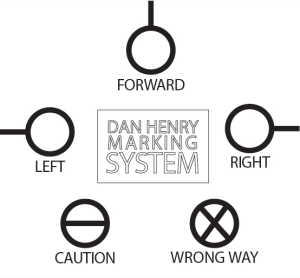 It takes a few seconds for a rider to see, process, and react to your directional arrows. Consider how fast your guests will be riding. Put yourself in the event. Assume they have no idea where you want them to go. Then when signs appear later, riders can confirm they are on course. Put your LAST warning mark at least 50-60 feet (20-25 long paces) before any feature that requires riders to make a decision (intersections, mainly) when approaching at speeds above. Give riders at least two warnings before an intersection, three or more if there’s something unusual about it like highways, turns at the bottom of hills, blind corners, etc. Give them one mark on the other side so they know they’re on the right path. Make your marks at least 100 feet apart (50 paces) where high speed approaches are possible. Use the same color, style, and size for every single mark you put on the road. If you must hide them discretely on the edge of the pavement, put ALL of them there so your riders get used to looking in the same place. Be consistent. Think like a rider at speed. Think about what it feels like to be there. Be considerate and thoughtful. Decide how you’re going to make your arrows and make them the same way every time. Decide what you’re going to write, if anything, and write it the same way every time. Decide where your arrows are going be in relation to what you write and put them the same place every time. Put your marks in the same basic position on the road and always put them where your riders are likely to be looking. Always use the same color of paint . . . every time. For urban routes - like our weeknight rides - the spacings noted previously aren’t always possible - and to save time one mark before and after a turn should be sufficient. Placement outside the area where tires roll helps the marks last a little longer. Dan Henrys- up to about 10 inches in diameter should be sufficient. This only works if you don’t overlap other routes. We use W’s with an arrow for Willard Bay; CR for Coffee Ride with an arrow; B for the Bike n Brew, etc. Any unique letter or symbol can work for your route. Uniform size and color are the key for whatever you choose. You have to use common sense and obey traffic laws and watch out for your own safety. After all, we’re talking about sharing open public roads with bigger, faster, heavier vehicles. No amount of excellent route marking can save you from yourself. Another option is leg mileage format. Example: Go R for 3 miles. No mileage readings on the cue could make your instructions more difficult to follow, unless street signs are easy to see. If a street sign is missing note it. Example: L- Smiths Lane- sign missing. Mark landmarks on your cue. Thanks to Cascade Bicycle Club for their mentoring guidelines and active membership requirements and the Louisville Bicycle Club for Ride Leader Credit clarifications and Sanctioning policy updates.